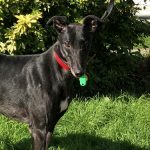 Greyhound Lifeline > News > When Connie Met Reg. This weekend our lovely girl Connie had a viewing with a special dog called Reg. The meeting went well and she is now reserved! 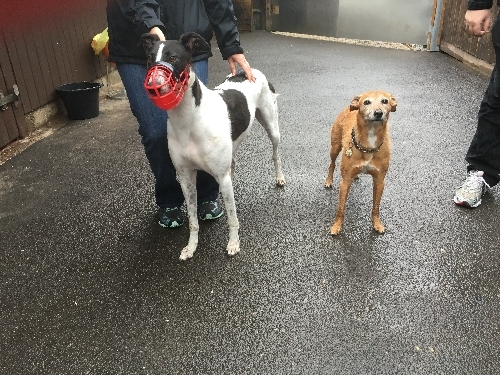 Connie will be heading off soon to start a new adventure with her new buddy. Some lovely news for a wet Saturday. Greyhounds make fantastic blood donors and our next public blood donation session is being held at our kennels on Sunday 25th September. There are still some appointments left to fill. Please consider booking your dog (subject to him/her being healthy, 25kg+ and aged 1-8yrs old) and maybe your pet could save another dog’s life. If interested please call Pet Blood Bank on 01509 232222 to discuss/book. Thank you. 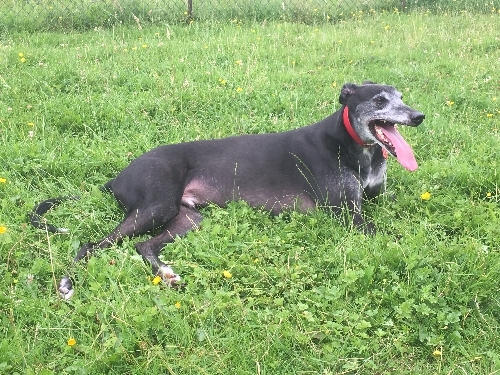 Winston has been in our care for several months now, he is an older chap of 9 years of age. Unfortunately he is finding kennel life too stressful, he so desperately needs a home of his own. Winston prefers his own space so therefore needs a home with no other pets with older teenagers or an adult only home. 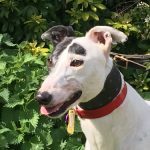 Please help us to find Winston a home he can call his own and allow him to bounce back to his normal cheeky, playful self. We urgently need help for Fridays, Thursdays, Saturdays and Sundays. We walk between 11am and finish around 12.30pm. Minimum age for dog walkers is 18 years. Thank you. Our stocks of tinned fish are getting rather low, some of our dogs are rather taken with their weekly fish dinners and would be very grateful if you could spare a couple of tins for them to have. The dogs love to eat sardines, tuna and pilchards in oil, spring water or tomato sauce, please can we ask for no brine tins please. Thank you from all the dogs in our care. 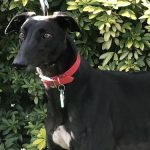 Please take a look at all the lovely greyhounds, most have updated descriptions, in our greyhounds for adoption gallery. We have some very friendly, loving greyhounds who have waited far too long for their forever homes. 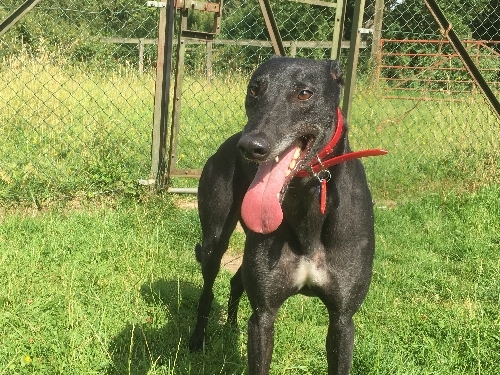 Could you give one of our hounds their dream home? 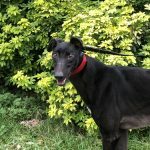 We still have, many long stayer greyhounds that joined us early 2015 or before this and are still looking for that special home. These dogs are Hammy, Willie, Jake, Suzi, Susie and Lyric. 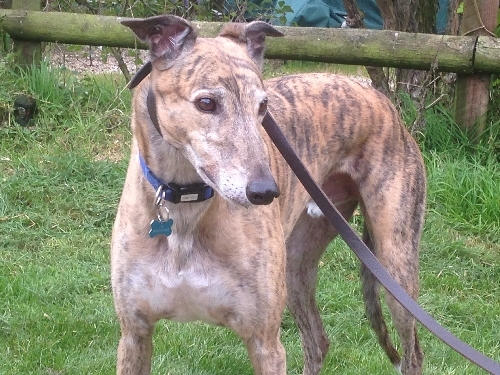 Please take a look at these greyhounds and hopefully 2016 will bring them homes of their own. Pippin, Hope, George and Demi. Charlie, Izzy, Doris and Pogo (arriving 11/9). Charlie enjoying a run in the paddock. Izzy is currently not available for adoption, she is receiving medical attention for an infected leg. Her leg is responding to the medication she is taking, the next step is for Izzy to have a course of physio to help improve the movement she has in her leg. Reggie, Willie, Susie, Cheetah, Hannah, Izzy & Suzi are in foster care. 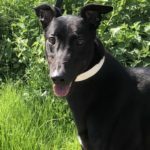 If one of our foster dogs interests you as a potential new family member then you simply need to contact us and we’ll arrange a mutually convenient date and time for you to meet him/her. We are rather short on blankets, towels and duvets for our kennel dogs. If you have anything suitable please bring it to the kennels. Please note we cannot use pillows or feather duvets. Thank you. Our stocks are starting to run low that we can sell to raise money to support the greyhounds in our care. Our wish list of goodies to sell include. Children’s toys, games (board, electronic and PlayStation/Xbox type), kitchen gadgets, utensils and crockery. Jigsaws, DVDs (not video tapes please), CD’s, ornaments and unopened/unwanted toiletries etc. Thank you for your continued support. Many of you may already know that the Retired Greyhound Trust collect used postage stamps to raise funds for the greyhounds in their care. For some of you collecting the occasional stamp here and there and finally getting around to posting a collection off may be a bit of a nuisance. If you bring them along to Greyhound Lifeline we can send them off for you when we have collected a larger amount. We also collect old mobile phones. 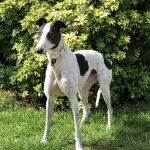 You can sell items on ebay and choose to donate between 10% and 100% of your sale price to Greyhound Lifeline. If you are an ebay member you could also simply donate by using your Paypal account. 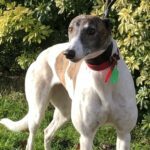 For ebay members only please visit their Sell for Charity page and enter “Greyhound Lifeline” in the Charity name area. If you are a UK tax payer please also tick the Gift Aid box. Please read ebay’s terms and conditions carefully as we cannot be held responsible for any problems you may encounter. Could you sell your unwanted items and help us to buy food, provide veterinary care and generally look after the greyhounds in our care at the same time. This entry was posted in News and tagged dog walkers, fundraising, new arrivals, Pet Blood Bank, small dog trainable by Lucy.